What does Iguazu Falls in South America have in common with these destinations: Table Mountain in South Africa, the Amazon Rainforest, Halong Bay in Vietnam, the Philippines’ Puerto Princesa Underground River, Jeju Island in South Korea, and Komodo Island in Indonesia? The answer: They are all included on the list of the New 7 Wonders of Nature. The stunning Iguazú Falls, located on the borders of Brazil, Argentina and Paraguay, are one of the most popular tourist destinations in Latin America. Niagara Falls doesn’t even come close to its beauty. There are 275 individual waterfalls, both big and small, spreading for almost two miles in magnificent rainforest settings. Everything around the falls is unspoiled: the exotic and breathtaking views, the thousands of birds and butterfly species and the beautiful nature trails. There are even boat rides that take you right into the heart of the action. Once you’re there, most things are reasonably priced, including park tickets, hotels, guides and transportation. The only thing that is expensive is getting there, but we know how to take care of that. Fly to Iguazú Falls on an award ticket. Two major airports serve Iguazú Falls: Foz do Iguaçu International Airport (IGU) in Brazil and Cataratas del Iguazú International Airport (IGR) in Argentina. All of the airlines serving the Falls are members of one of the three alliances, or in the case of AZUL Brazilian Airlines, a United partner. Let’s look at each airport separately to see how you can get to this wonder of nature. American Airlines partner TAM is the cheapest option if you’re looking for a one-way premium cabin award seat or off-peak flight from the U.S. It costs 30,000 miles in economy, 50,000 in business and 62,500 in first. However, if you fly off-peak between March 1 and May 31, or August 16 and November 30, your flight will only cost 20,000 miles. You have to call American to redeem your flight on TAM, but they will waive the $25 phone booking fee. Using the other American Airlines partner, LAN Peru, requires the same miles, but it isn’t the best option. You’ll have to route your flight through Lima, and availability can be hard to come by, especially for the second leg of the trip. 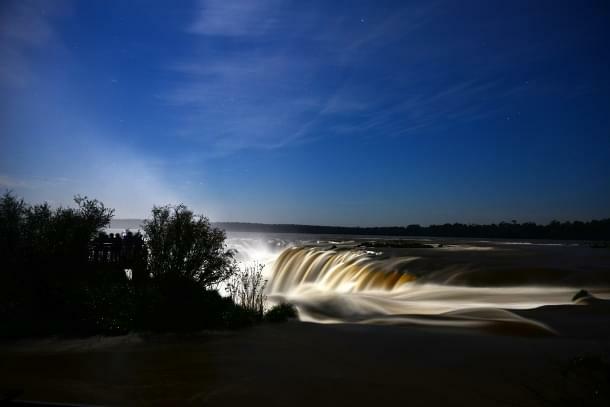 AZUL flies to Foz do Iguaçu from Fort Lauderdale via Sao Paulo, making it another convenient option to get to Iguazú Falls from the U.S. AZUL doesn’t show up on United’s website for booking, so again you’ll have to call. An award seat on AZUL, or on a mixed United partner and AZUL flight, costs 30,000 miles in coach, 55,000 miles in business, and 70,000 in first each way. GOL is a domestic Brazilian carrier, so it doesn’t fly from the U.S. You can use Delta SkyMiles to get from the U.S to Brazil and take GOL for the second leg of your trip from Rio or Sao Paulo to the local aiport. You have to call Delta to book. The Delta award will cost 30,000 miles in coach or 62,500 miles in business class. You can’t book first class on Delta with SkyMiles. This Argentinian airport is served by two airlines: Aerolineas Argentinas, which is a Delta partner and SkyTeam member, and LAN Argentina. LAN is an American Airlines partner and oneworld member. The redemption rates to Cataratas del Iguazú are the same as for flights to Foz do Iguaçu. So flights on LAN Argentina or any combination of LAN Argentina and other oneworld carriers will run you 30,000 miles in economy, 50,000 in business and 62,500 in first each way. A flight on Aerolineas Argentinas will cost you 30,000 SkyMiles in coach or 62,500 SkyMiles in business class. Keep in mind that, as with TAM and other American Airlines’ partners, LAN offers discounted off-peak rates. So if you’re flying at the right time, they are the most affordable choice to get to this airport. Whichever airline you choose, you will have to call, as you can’t book them on their respective websites. This is a long journey, but it will be well worth it when you see the amazing waterfalls.